"THE ORCHID COTTAGE" PETS OK! "65" 4K HDTV HOME THEATER SYSTEM"
25 YR. OLD ORCHIDS with VIEW of HISTORIC MORRO ROCK. Streaming TV from a STATE OF THE ART 65" SAMSUNG 4K ULTRA HIGH DEFINITION THEATER SYSTEM. STREAMING OPTIONS: DIRECT TV NOW, NETFLIX, HULU, AMAZON PRIME, MLB TV, & Much Much More! Walking Distance to the Beach, Restaurants & Market! Everything Needed For a Comfortable Stay in BEAUTIFUL MORRO BAY..... RELAX AND ENJOY! *DIRECT TV NOW, NETFLIX, HULU, AMAZON PRIME & MORE! *NETGEAR ROUTER "USE ALL WIRELESS DEVICES"
Fully Equipped Kitchen, Gas Range, Dishwasher, Washer/Dryer, Cast Iron, Stainless & Porcelain Pans, Calphalon Forged Cutlery. Spices/Food Pantry Items Crystal Glasses, Mikasa & Ralph Lauren Flatware/Dishes. Mountain View, Manicured Lawn, Orchids, Meyer Lemon Tree, Artichokes. STAR GAZE in the "HOTSPRINGS HOT TUB"! Outdoor Hot and Cold Shower, BAR-B-Q's Galore PROFESSIONAL TURBO 60,000 BTU BBQ & Weber Charcoal BBQ. 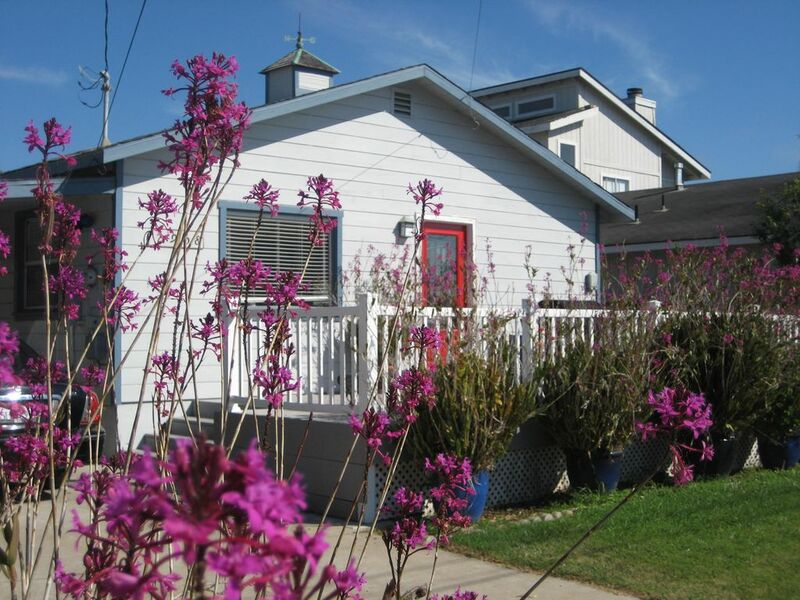 "LUXURIOUS COTTAGE IN BEAUTIFUL MORRO BAY, CA"
Please Feel Free to Contact Me Direct With Any Questions or Concerns. "HIGH SPEED WIRELESS INTERNET ACCESS" "COMPREHENSIVE TV PROGRAMMING" 5 MIN. WALK TO A SANDY BEACH, OFF LEASH DOG BEACH 1 MILE NORTH. 2 CAL KING PREMIUM BEDDING WITH 32" TV SUITES 65" UTRA 4K HD TV THEATER SYSTEM STOCKED FOOD PANTRY HOTSPRINGS HOT TUB OUTDOOR HOT AND COLD SHOWER SPACIOUS STREET TO STREET LOT FRUIT TREES. COMPLETE PANTRY ITEMS FOR MEAL PREPARATION WHICH INC.. (Everything needed) BEANS, RICE, PASTA, OLIVE OIL BALSAMIC VINEGAR, COFFEE & TEA * PANTRY LOADED!!! Location location location! It was so close to the beach that we went on a run every morning and went down to the beach every day to play in the sand and walk to the rock. It was a quick drive to downtown Morro Bay, and an easy drive to San Luis Obispo for our outings and for dinner. We loved the deck and the comfy chairs, although we did bring our own beach chairs so that we could recline and watch the stars. Beds and sheets were comfy, and there were plenty of towels which made it super nice! Kitchen has everything you need and it is well thought out. We enjoyed cooking and making coffee every morning. The backyard had a great grassy area for stretching and there were blackberries and lemons to pick and enjoy. We didn't get a chance to use the hot tub, but it looked clean and well-maintained. Barron's communication via email was great and the entire thing was seamless. Would stay again! Super cute place, comfy beds. Nice kitchen with lots of space. The remotes for the tv were a little confusing but we managed. The hot tub was a nice bonus. My friend and I really enjoyed our stay at The Orchid Cottage. Like most reviews mentioned the kitchen is well stocked, the beds were super comfortable, lots of media options, strong wifi, good water pressure, and overall well appointed with everything you'd need for a comfortable stay. We especially enjoyed the front patio for afternoon sunbathing. It's a private, cozy house. Owner was very responsive to questions. We will book this place again. Nice quiet street. Nice clean house! Great place. Nice quiet street! Charming, comfortable, clean. Everything you would need is already there. Wonderful place to stay. Stayed with our 3 teenage boys and had a great time. The beds and bedding were very comfortable. The hot tub was really nice and we loved how dog friendly it all was. We would stay there again.